As you know, our State legislature has been working for some time on legislation to deal with the number of calamity days schools have had to take during this winter season. We now know how the new legislation impacts Monroe Schools, and are ready to implement the three days of blizzard bags. This alternative will prevent us from having to extend the school days in our calendar to May 30, June 2 and 3. The first of our three "blizzard bags" will be assigned to students this Friday, March 21, and are due back to the teachers on Friday, April, 11. The second blizzard bag will be assigned to students on Friday, April 11 with a due date of April 25. The third and final blizzard bag will be assigned Friday, April 25 with a due date of Friday, May 9. The primary and elementary buildings will be offering their assignments online, and providing hard copies to those students who do not have internet access at home. The majority of junior and senior high school teachers will be be providing hard copy assignments to their students on Friday, but some will also be posting their assignments on the web. We hope that your children find the assignments as helpful reinforcements to the instruction they are gaining in their classrooms. If you have any questions about the process or the actual assignments, please contact your child's classroom teacher. 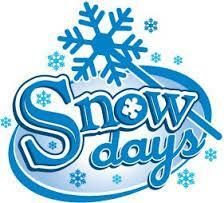 Please click the links below for primary and elementary school blizzard bags.